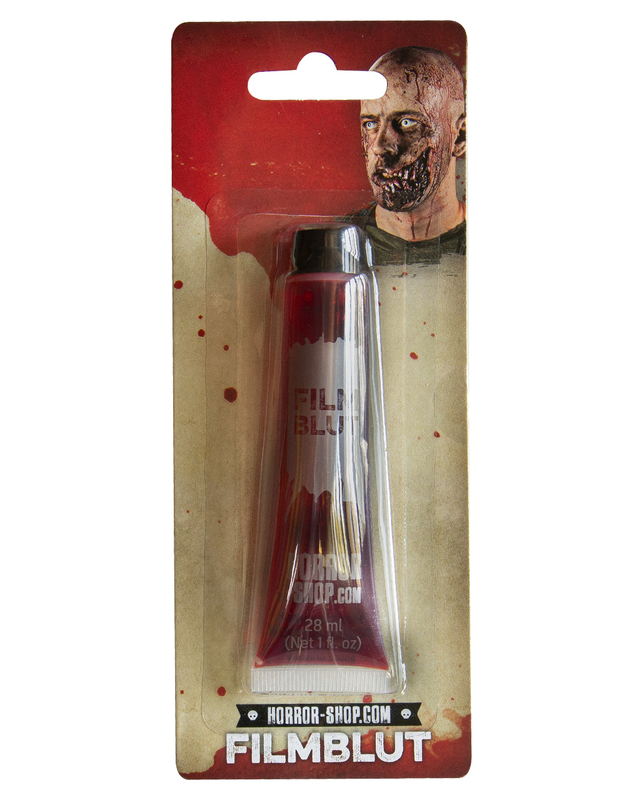 No matter if you want to decorate your Halloween party with our horror shop Filmblut 28ml or if you use it classically for your horror special make-up - your Halloween props should not miss it. What would many a horror film or zombie walk be without a lot of fake blood & film blood, which rarely misses its effect as a shock effect? Blood red and viscous, artificial blood & film blood can be used for many effects. 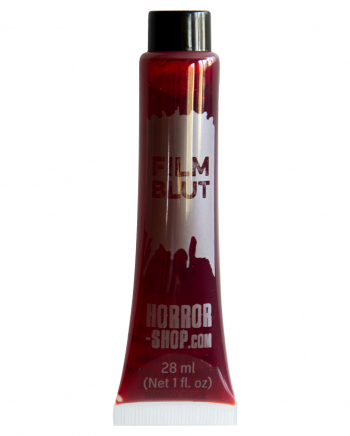 The dark red Horror-Shop Filmblut 28ml can be used as artificial blood for many special FX effects and is very economical. If you want the film blood even thicker or even for small blood clots, mix a little of the artificial blood & film blood with some rusk crumbs or coffee powder. When decorating, please make sure that you test the artificial blood & film blood for removability at an inconspicuous spot. Prefer to use clothes and costumes that do not need to be completely clean afterwards. Do not use the film blood on upholstery or carpets. If the artificial blood is used for make-up effects, the film blood can be removed again with water and soap. This may require several passes. For really drastic and plastic make-up effects, we recommend you in addition to our latex wounds our Crust Blood With Stubble Sponge 25g and Latex Milk 56ml With Sponge. As with all decorative cosmetics, allergic skin reactions can occur in sensitive persons. It is therefore recommended that a test be carried out in the crook of the arm before using the product in order to rule out any allergic reactions. Apply the product to a small area of the crook of the arm and allow to work for approx. 30-60 minutes. If an allergic skin reaction occurs, use of the product is not recommended.